five of these studies relied on randomised control designs, two were quasi experimental designs, and at least 15 used a participatory design. Many of these studies utilised a mixed method approach to ensure that the findings were contextualised and that the approach adopted was consistent with the values of the organisation. In addition to independent evaluative studies, this meta review also refers to internal reports and articles written by Sonke. These are used to provide a description of the work that has been done to assist to make meaning of the findings. However, the evidence that has been relied on to inform the evaluative findings with respect to successes and challenges has been drawn only from evaluative studies. 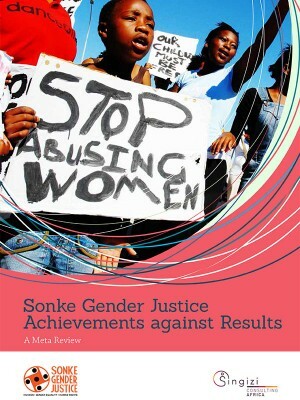 These include the myriad of external evaluation studies that have been undertaken on the different aspects of the work of Sonke. In addition, where there were internal evaluative studies conducted utilising credible methodologies these were also referred to, as the findings are considered valid and they represent an important element of the organisation’s on-going commitment to strengthening its practice.